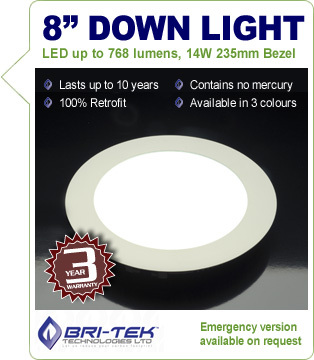 This panel light is at the cutting edge of LED technology. These high efficiency lamps use only 14W and when comparing this to its florescent replacement (60W) it uses less than half the electricity. It consists of over ? Led's yet thanks to the frosted glass it produces a uniform light source. With an aluminium alloy frame and being only 20mm thin, this sleak and contemporary design makes it suitable for any application from offices to store displays. Available in either cool white producing 542 lumens or Warm white producing 493 lumens. Dimmable option is available in addition to an & emergancy backup options which consists of a 3 hour ringtail battery pack.